Today was the day trip to Estonia. We woke to clear blue skies in Helsinki and the forecast of rain in Tallinn so the trip was in doubt right from the start as the prospect of giving up on a sunny day in a city we’d only just started to get to know to travel for 2.5hrs only to get rained on in an unknown town didn’t quite seem as appealing as it had done when the trip was first being planned. Thankfully, we decided to brave it anyway and the trip to Estonia became one of the best days we’ve had in Finland! 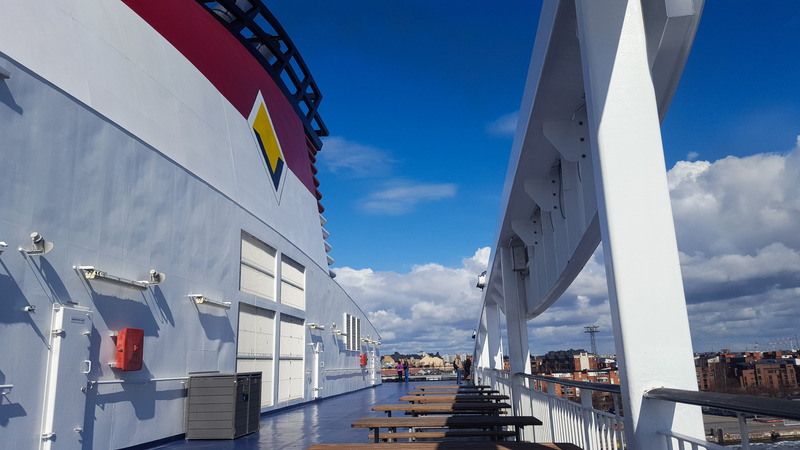 We were sailing on the Viking Line express from Helsinki, which despite being what is essentially an international ferry crossing costs only €14 return per person. The ferry is huge, 10 decks, 6 of which are full of bars, cafes, restaurants, duty free shops and entertainment. Not to mention 2 decks of external viewing spaces. 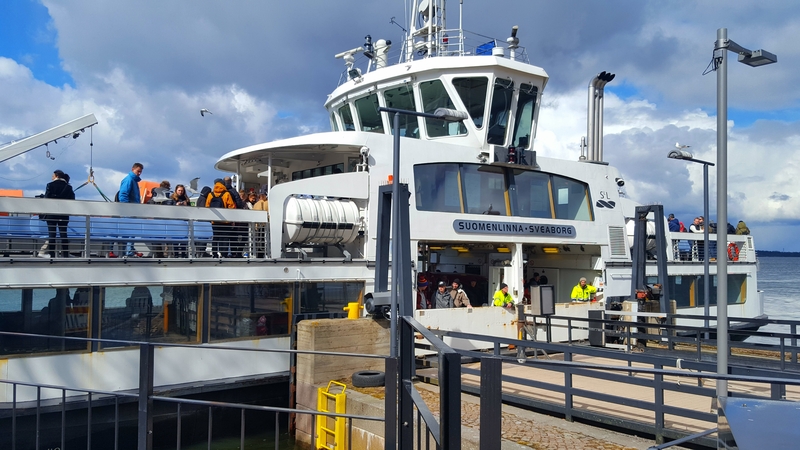 The ferry departed exactly on time and made its way slowly out past the small islands we’d passed on our way to Suomenlinna the other day. Its route slips between the fortress and another nearby island before entering open sea (Baltic Sea / Gulf of Finland) and the captain hits whatever the accelerator is called on a ferry and the ship lunges forward on its 50 mile trip to Tallinn. The crossing is remarkably smooth and fast and in no time we were docking in Tallinn. 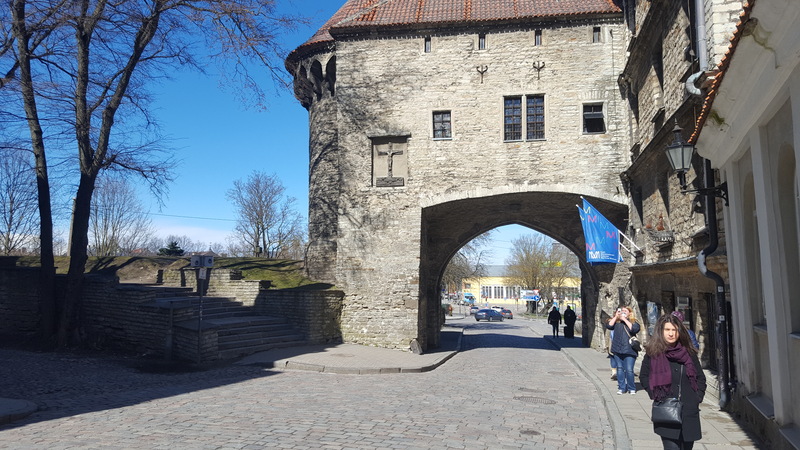 We only had 4hrs in Tallinn and a few people had advised spending it all in the old town so as soon as we’d disembarked we set off towards what is described as one of the best preserved medieval cities in Europe. We entered the city through one of the gates and made our way along old cobbled streets past buildings, brightly painted, each of which felt like it had a long story to tell. 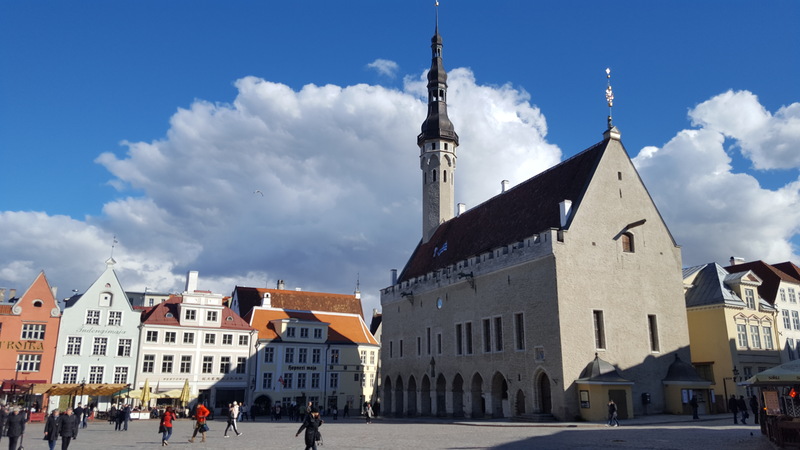 We followed a route called Pikk down to Town Hall Square, an impressive area flanked on 3 sides by restaurants of all kinds from traditional Estonian, through Russian, Chinese, Italian, Spanish, Indian and Finnish. 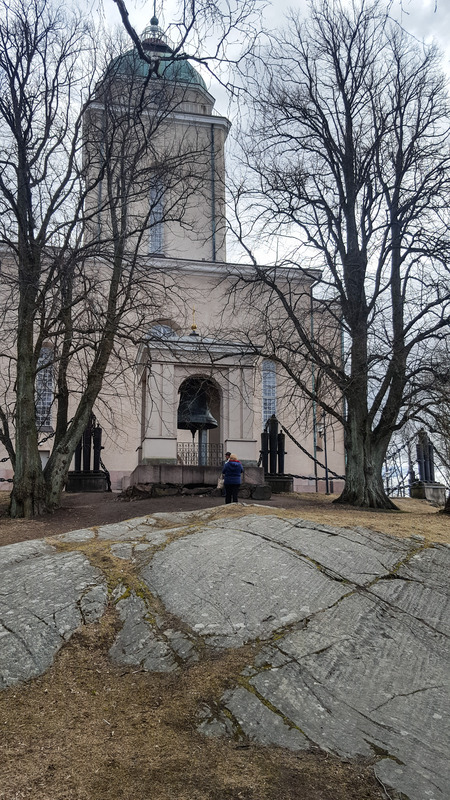 We decided to do some sightseeing before lunch so, continued down from the square until we reached a path which climbed up a small hill towards a large church which seemed to have a great view of the city. After an hour of wandering aimlessly through the back streets, photographing everything and anything, we headed over to a view point which sits high above the medieval town to grab some more shots before packing the camera away and heading off for lunch. As we arrived a street musician was playing some traditional Estonian music on a guitar but shortly behind us came a large party of Japanese tourists on a guided walk. Seeing the group the musician immediately asked the guide “Nihon?” And when the guide confirmed that they were Japanese, the guy seamlessly switched from Estonian folk songs to Japanese! Including singing in Japanese! The tour group loved it and were soon singing along and dancing a traditional dance – complete with elaborate hand gestures and fans. We left to the sounds of them all singing the Japanese national anthem! A great touch from the musician I thought. I hope after they’d all finished getting selfies with him they remembered to reward him! From the viewpoint we returned to Town Hall Square. Tallinn, like many cities around the world, has a Scottish themed bar so I wanted to pay a visit and have a photo taken but unfortunately it was closed until 5pm, but next door there was a lovely little Estonian restaurant so we decided to eat there. Thankfully this place didn’t have the traditional Estonian dish which we saw on sale at most of the other places on Town Hall Square… bear meat. The grilled salmon and roasted vegetables in a white wine sauce was beautiful and as we sipped a glass of Italian wine we agreed that a longer visit to Estonia was needed to do the place justice. I may well be blogging about another Estonian trip in the near future! After lunch we had time for another wander around the narrow lanes and winding cobbled streets of Tallinn before reluctantly returning to Pikk and retracing our steps back to the ferry port. 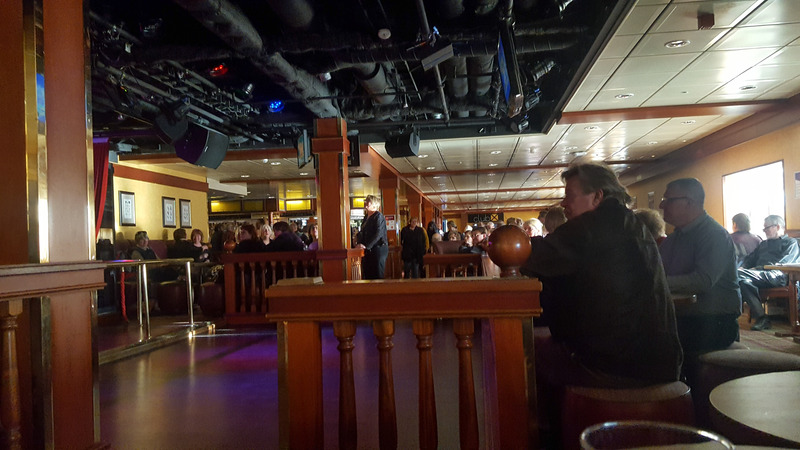 When we arrived, the ferry was already boarding so we headed on board and back to the Viking Bar. Sure enough, a crew member soon appeared, note pads and song lists were placed neatly on a table before INSTANTLY disappearing into the crowd and they were off… it was a race to see who could select a song, write it down – no easy task with a language where 30 letter words aren’t unusual – then get their entry up and accepted first. I’ve got to say it was a close call as 2 men and a woman bolted for the stage but a winner was selected and he immediately broke into a traditional Finnish song. The audience sang along, hands were clapped, and everyone had a great time. There were even some tears shed as every song was greeted with enthusiastic applause. The crossing seemed much quicker on the return and the imminent docking back in Helsinki was viewed with some disappointment in certain quarters as rehearsed songs went unsung for another trip. I’ve been impressed by the Finnish people from the moment I arrived here. They are polite, tolerant and clearly have a little quirky independent streak when it comes to style, art and architecture but those 2hrs spent sailing across the Baltic with them serenading each other confirmed to me that they are a great people. From this point onwards if anyone ever asks me to recommend something to do in Helsinki, I’ll be recommending they leave as soon as they can and get the boat to Tallinn, if only so they can sail back again! Woke this morning to heavy snow, so before breakfast I grabbed my camera and headed out to try to capture some pics of Helsinki in the snow. It felt very atmospheric as the snow muffled most of the sounds of the city but the distant bells of the cathedral could still be heard ringing out as I wandered up and down quiet streets snapping pics. It was a great start to the day and I managed to get some nice moody snowy photos of the central square, train station, trams, people with umbrellas and statues in the snow. As the snow got lighter and the sun began to break through the heavy clouds I headed back to the hotel for some well earned breakfast. Today was a relatively free day and as the weather wasn’t ideal for walking we decided to start with some indoor locations so after breakfast we set off on the 1km walk to the “church in the rock”. Temppeliaukio Church is a popular tourist site due to its unusual architecture. 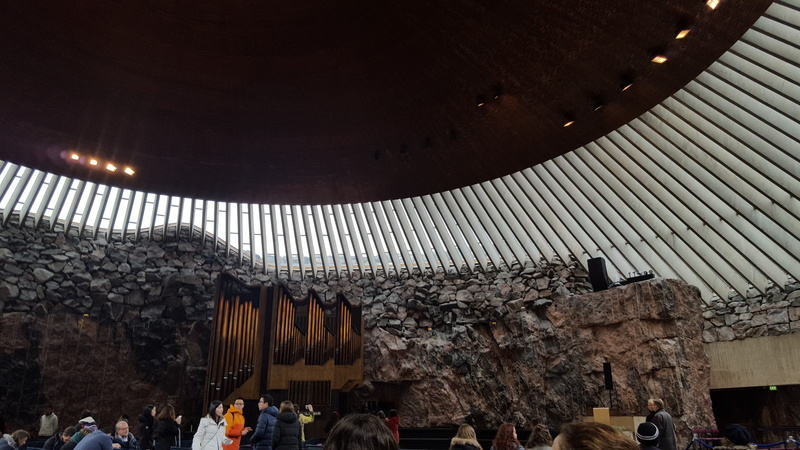 The church was designed in the late 1960s and is carved directly into solid rock, hence the name “church in the rock” or rock church. The church is covered by a huge copper dome and the interior is lit by natural light which floods in through slats which circle the entire church between the dome and the rock. Also used as a music venue due to the amazing acoustics, the church is a very popular spot with tourists. After the church, and with the weather less than perfect for photography we decided to finish off the souvenir shopping before returning to the hotel to drop off the bags. The afternoon was spent in an Australian bar eating pizza and watching football for a few hours. Around 7pm we noticed that the light was improving and the sky had cleared so we returned to the hotel, grabbed the cameras and set off once more for a walk down to the waterfront in the hope of grabbing some nice shots of the seafront at dusk. It was beautiful in the dark, but very cold as the wind coming in over the Baltic Sea, seemed to cut right through all our layers of “weather proof” clothing to chill right to the bone. After a few shots by the sea we headed back to the more sheltered Senate Square to grab more photos of the square and cathedral. The walk back to the hotel was lovely as the fading light was ideal for some street photography. Dimly lit alleys, neon signs and empty trams trundling through deserted streets where the tram lines, lit by street lamps, seemed to run like rivers of fire in the dark all made for what I hope will be some great photographs. Tomorrow is a day trip to Tallinn, Estonia so back at the hotel i had just enough time to recharge my camera batteries and clean the lenses before a quick bath and an early night. Looking forward to Tallinn tomorrow! Day 3 began with a stroll to Market Square to catch the ferry across to Suomenlinna. It’s a short sailing but an enjoyable one as the ferry weaves between little islands, some of which seem to be just a little larger than the buildings built on them! 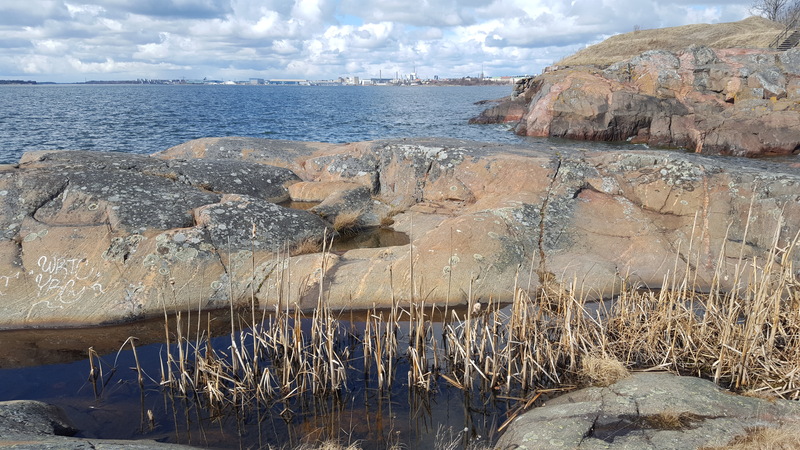 It had rained earlier this morning but by the time we set foot on Suomenlinna the rain had stopped and the the sun was breaking through. 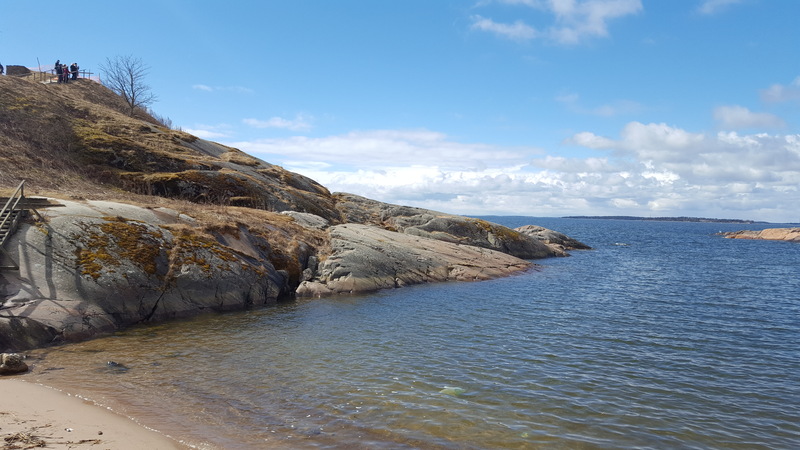 It felt like a pleasant spring morning as we wandered from the main Quay on the island of Iso Mustasaari, the largest of the six islands which make up the fortress. Suomenlinna sea fortress was founded in 1748 on a cluster of islands off the coast of Helsinki at a time when Finland was still part of the Kingdom of Sweden. 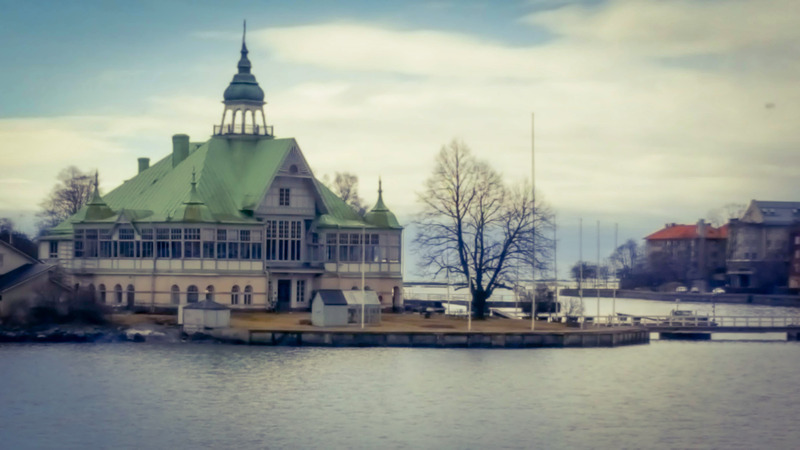 The islands, which once housed quays for warships, heavy gun artillery batteries and barracks for troops and sailors throughout periods of Swedish then later Russian rule has become home to around 800 locals, arts and crafts shops, an art school, museums and cafes. Rather than remove the weapons, the former machines of war have been adapted to more peaceful uses. 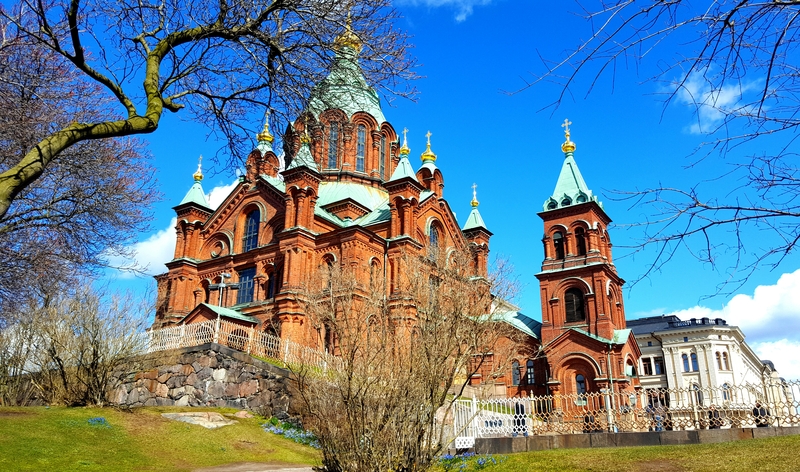 For instance, there is a children’s play park where a nearby entrance is formed by huge artillery shell casings and Suomenlinna Church, which stands on a raised point just inside the fortress walls, has a boundary fence made from huge cannons and heavy duty chains. This idea of adapting the past rather than attempt to erase it or pretend it didn’t happen gives the whole island fortress an optimistic feel. Children playing in former weapons bunkers and people picnicking beneath the huge artillery guns which permanently point West thanks to the period of anti-western Russian rule seems like a much more fitting legacy for the now silent weapons. Spring turned to summer as we crossed the little white bridge to the island of Susisaari and continued along the waymarked route to the southern Kings Gate Quay on the island of Kustaanmiekka. Apparently popular in the summer as a great swimming spot, we only saw ducks and a flock of geese braving the waves today. After a short break we continued to the King’s Gate, in summer a second ferry connection point to the mainland, before returning back along the coast towards the museums and cafes. 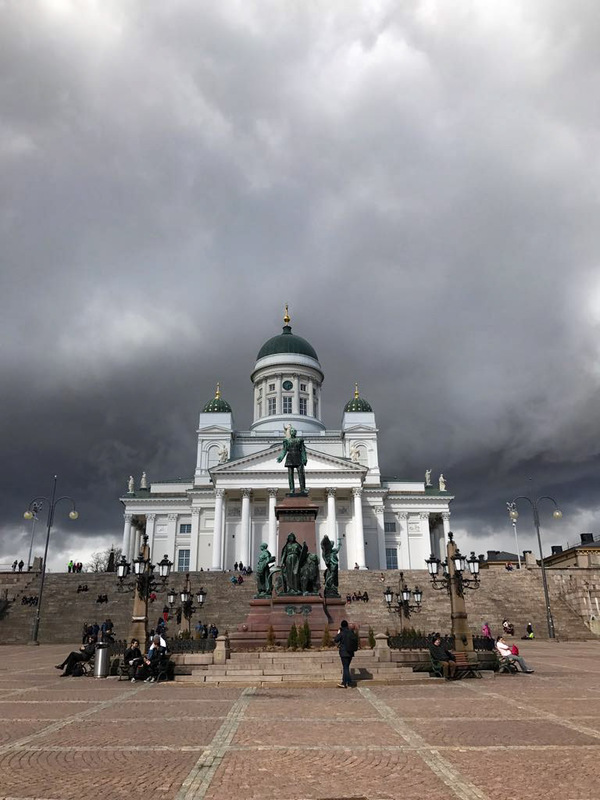 After a short walk back we decided to take the ferry back to the mainland and grab some lunch as some very dark clouds were gathering above Helsinki. We arrived back in Market Square and spent some time buying gifts and souvenirs before strolling back to the cathedral square to shoot some photos of the white cathedral now starkly contrasted against the almost jet black sky. After a little more shopping we stopped for some lunch (Finnish beer and Mexican Burrito). Almost as soon as we sat down the heavens opened at snow fell heavily for a while before turning to sleet then rain. By the time we’d finished lunch, the sun had returned and the snow was melting. This evening was spent doing a little more shopping before settling down in a “London themed bar” for a few beers. The bar was having a “weisse beer week” promotion so we tried a local beer then an old German favourite. While in the bar the weather outside the window decided to run through the seasons once more as the late afternoon spring sun turned once more to snow, whipped up by sudden gusts of wind into almost blizzard conditions before a temperature drop turned the snow to heavy hailstones which rattled the bar windows and threatened to crack car windscreens. By the second beer the hail had subsided, giving way to some overcast skies which by the time we were leaving had once more turned blue. The weather for tomorrow isn’t looking great but the forecast for Monday is good, so tonight we booked our tickets to cross to Tallinn in Estonia on Monday. 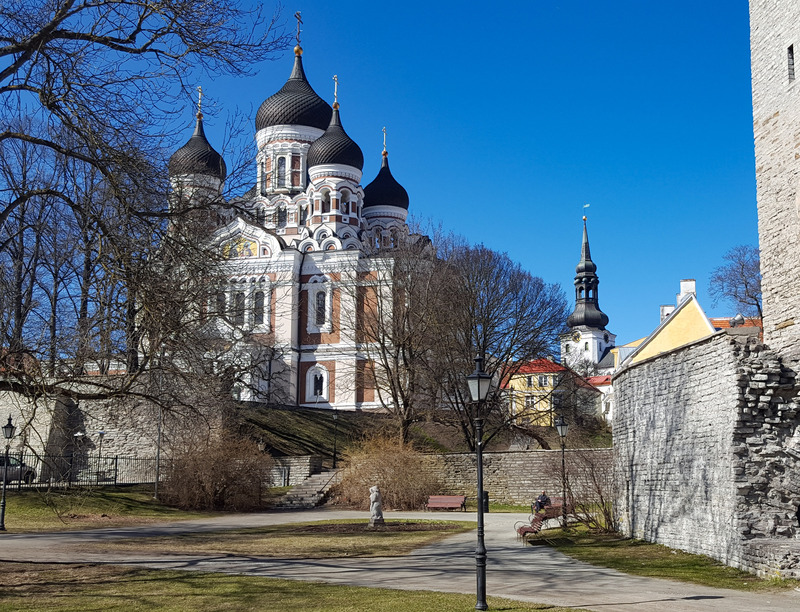 We don’t have long (around 4hrs) in Tallinn but I’m looking forward to photographing the medieval streets of what is supposed to be a beautiful little city. Day 2 should have included a visit to a national park on the outskirts of Finlands second largest city (Esboo) but instead the morning was spent shopping for essentials thanks to an email from KLM advising that the missing luggage had arrived at Helsinki airport just after midnight but had then sat in storage until just after 9am this morning when it was handed to a courier for delivery “sometime in the next 24hrs”. The prospect of another day without essentials meant a reshuffle of plans. It may now mean that the photo trip to the national park will have to be dropped from the schedule, which will be disappointing. 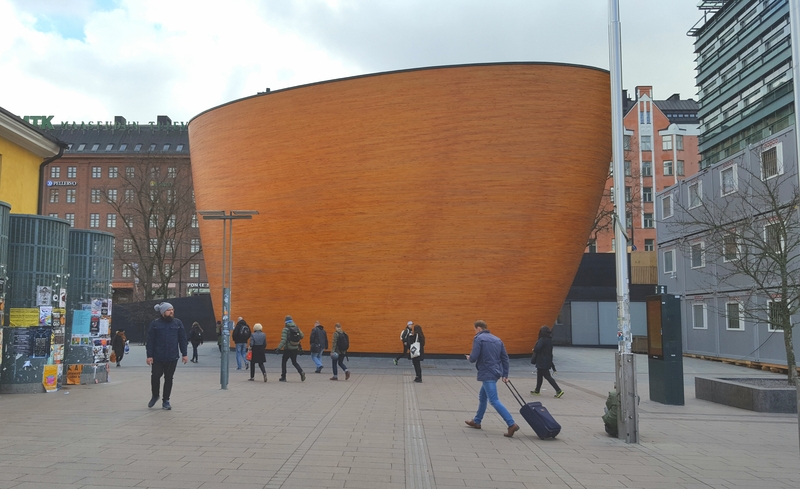 After shopping, it was time to explore the city centre and we began with a brief walk to the Kamppi Chapel, or as it’s also known, the Chapel of Silence, a Lutheran chapel intended as a quiet place in one of the busiest parts of the city. The Chapel has won lots of awards for its design and is popular with visitors and locals alike. It’s situated on a busy square which has lots of popular clubs, bars and restaurants nearby and worth a visit if you’re in the area. From Kamppi it was a short stroll down to a lake past Musiikkitalo, a music venue close to the Parliament buildings. The views out over the lake towards the Linnanmaki amusement park overlook some lovely old buildings, including the stunning Kivi-talo Säätiö banqueting Hall. 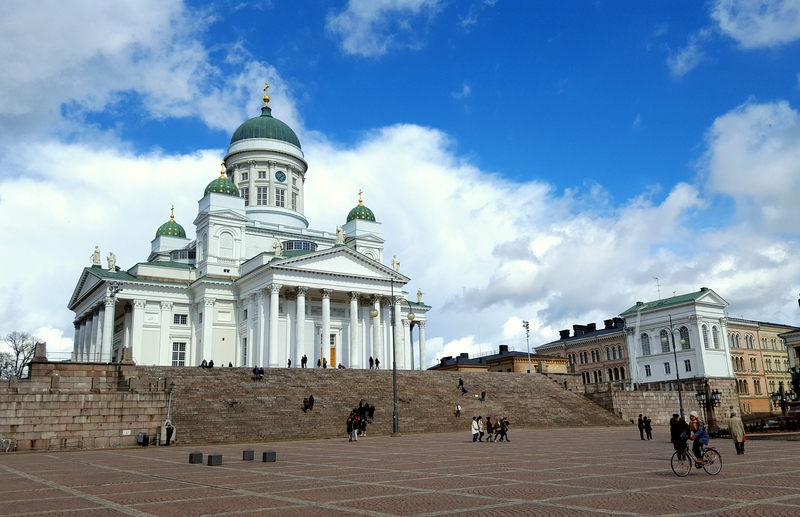 After some photography at the lake it was back towards the train station for the walk to one of Helsinki’s best known sightseeing spots, Helsinki Cathedral. Like the exterior, the inside of the cathedral is white and laid out in the form of a Greek cross. Thankfully photography is allowed and I managed to grab some shots of both the interior and exterior which I’ll post on my instagram and Facebook pages when I return home. The exterior of the cathedral is illuminated after dark so it was decided that a return trip later, weather permitting, was a good idea. 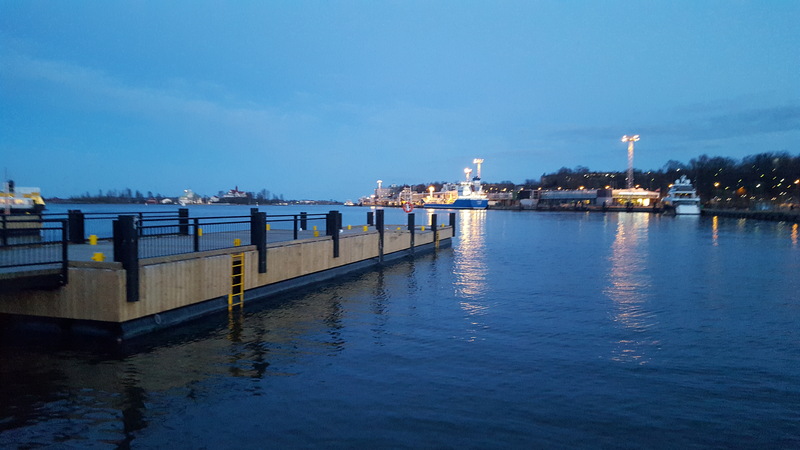 After lunch a brief walk took us past the ferry terminal for connections to Suomenlinna, an inhabited sea fortress built over 6 islands and now a World Heritage Site. I hope to visit Suomenlinna later in the trip so I’ll leave any further descriptions until then. The next stop was the Russian Orthodox Uspenski Cathedral, a lovely building set on a hill overlooking the city. The interior of the cathedral is elaborately decorated and a stark contrast to the Lutheran Helsinki Cathedral. Russian icons of saints and biblical figures cover the walls and ceilings of the cathedral. Again, photography was allowed (with a restriction on the use of flash to protect the paintings) so I hope to have some nice shots from inside to share when I get home. Thankfully it had! So following a quick shower and change of clothes it was back out into a now bustling Friday evening to try out a few local bars. First stop was a little wine bar near to the hotel. Despite the fact it was snowing heavily less than 24hrs ago the tables outside the bar were almost full so we settled down in the warm evening sun with a glass of wine to watch the world go by for a while. From the wine bar we walked back to the square near the silent chapel which was now full of tables, busy with locals and tourists enjoying a drink in the sun. Finding a table outside a popular bar we did a spot of people watching for a while. As the sun slipped behind the tall buildings surrounding the plaza, the temperature dropped suddenly, a sign that it was time to find a warmer spot to sit! We wandered past the railway station, pausing for a few photographs, then headed for a bar we had passed last night and which seemed quite popular with the locals. A beer by the window allowed us to gaze out at the Helsinki streets as trams trundled past and the streets grew busier, and darker. 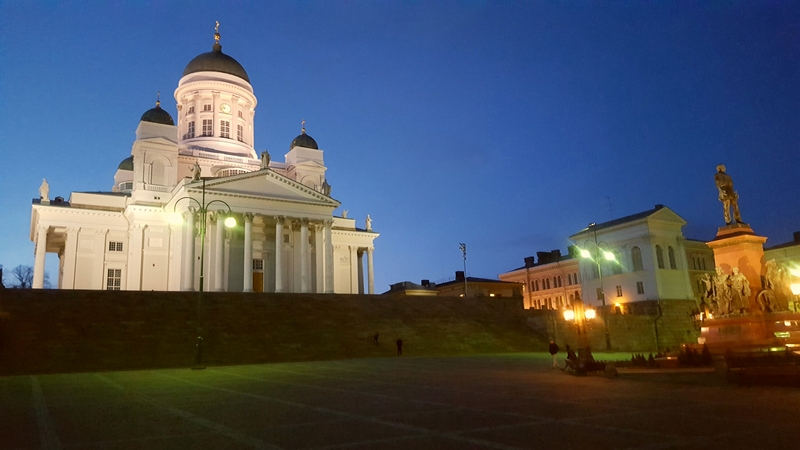 When it was dark enough, it was time to return to Helsinki Cathedral for some shots of the illuminated square. The return walk to the hotel via the Esplanadi rounded off a lovely day. Tomorrow had been pencilled in for a day trip to Tallinn in Estonia, a 2hr sailing away, but with the rescheduling thanks to the luggage fiasco, and with the uncertainty regarding that “sometime in the next 24hrs” email it was decided prudent not to pre-book the tickets just in case we had to cancel. Depending on the weather in the morning it could mean an early dash to see if there are any same-day tickets available for the crossing to Estonia, or perhaps just a trip over to Suomenlinna. 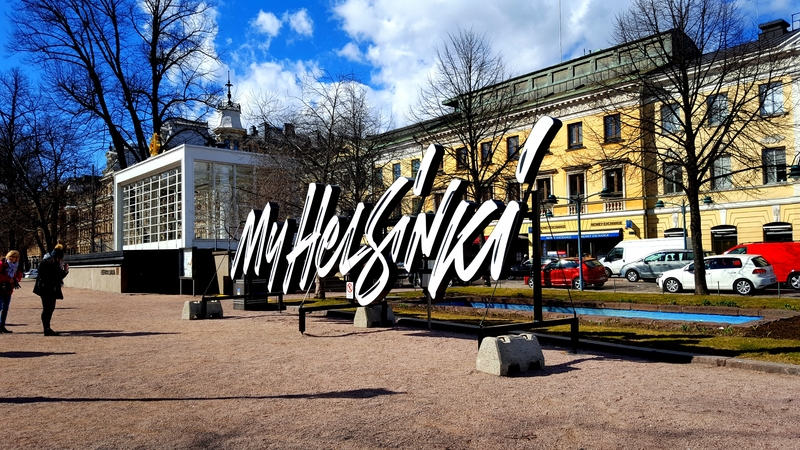 There’s also a lot more of Helsinki to see so it could just turn out to be another day of sightseeing. Find out what we decide in tomorrow’s blog! Day 1 began with a 2.30am rise, a brief drive to Glasgow International Airport, breakfast (and obligatory first beer of the trip!) 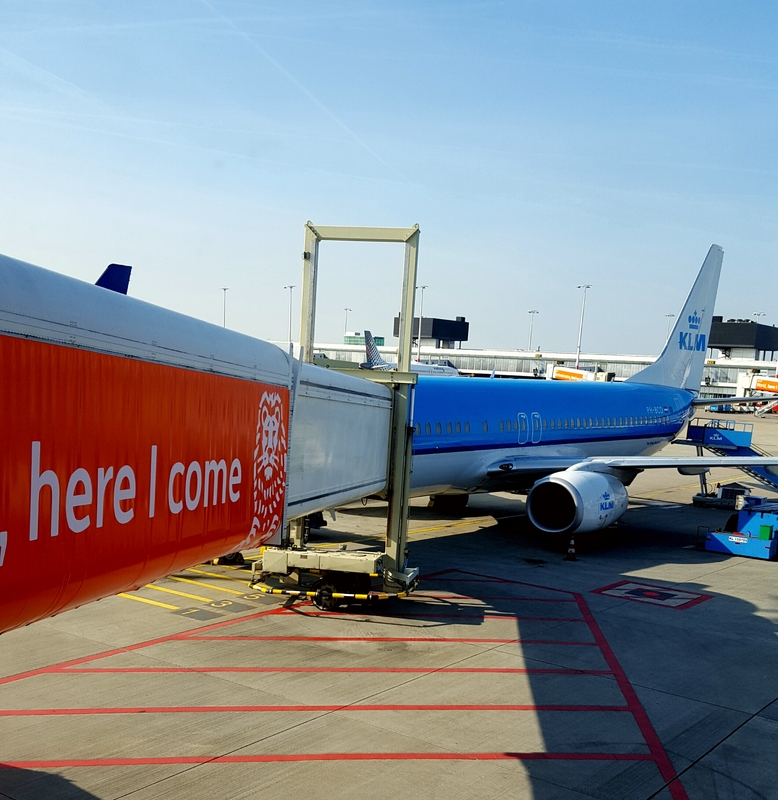 then an early morning short flight to Schipol, Amsterdam for the connecting flight to Helsinki. Hindsight is a wonderful thing and I now realise that I probably should have seen some problems looming on the horizon when the captain of the flight announced that, despite it only being 6am, air traffic control had instructed him to delay take off due to congestion in the skies over Amsterdam. When we finally did take off we were facing the prospect of a very short connection time at Schipol. Thankfully the long dash from the end of Pier D to the departure gate on Pier C was helped slightly by sidestepping passport checks thanks to the automated EU Passport scanning service. (Should be a much more “interesting” experience in a post Brexit world!) and we made our connection with 20 minutes to spare. The 2hr 20 minutes flight from the Netherlands arcs north east over Denmark and southern Sweden before crossing the Baltic Sea to reach Helsinki on the southern coast of Finland. The flight was relaxed with a lovely in-flight meal of pasta and wine to help while away the miles..
At Helsinki baggage collection, we watched with increasing frustration as the circling luggage was picked off piece by piece, much like watching predators strip a carcass, until half an hour later, we faced an empty carousel, stripped bare, as it rattled slowly around with each lap confirming the annoying truth that our luggage hadn’t made the connection. KLM cheerfully advised that the luggage would be placed on the next available flight and brought to our hotel in central Helsinki. 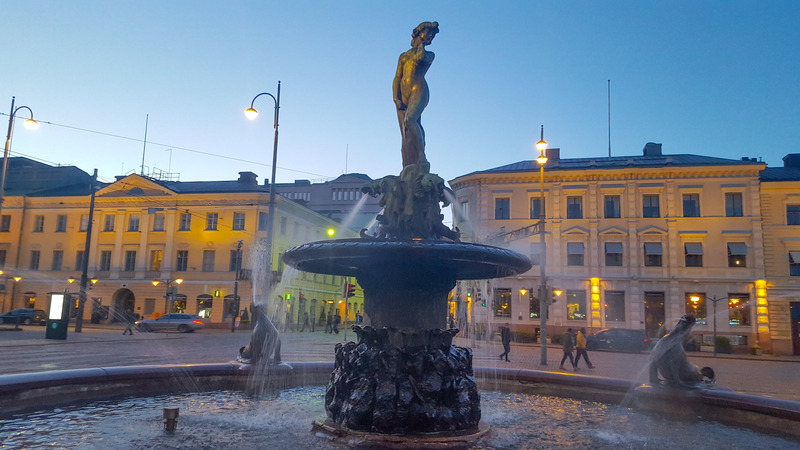 With the next flight expected in at 5pm, and another at midnight it seemed like a possible win-win as the trip from the airport was suddenly made all the easier without the burden of dragging luggage through the streets of central Helsinki. We took the airport bus to the city centre, a relaxed 30 minute tour around the outskirts of the city, then, getting off at the square next to the main train station, we set off for what turned out to be a very brief 5 minute walk to the hotel. After a short break at the hotel, and the removal of most of my camera gear from my hand luggage to lighten the load, it was time for a quick exploration of central Helsinki. First impressions are very good, with the city having a very distinctive look and a relaxed atmosphere. The people seem very friendly and their fluent grasp of English is a huge benefit as im embarrassed to say that my knowledge of Finnish, or even Swedish (which most people also speak fluently) is zero. I grabbed some reference shots, mainly of the cathedral and surroundinf street scenes, and im looking forward to revisiting those areas when the light is better. Weather will be interesting throughout the visit. At 3pm today it was warm, sunny and slightly humid, by 5pm it was overcast, freezing and windy, 9pm saw snow turn slowly to sleet and finally to heavy rain. Felt like a typical Glasgow summers day really! Tomorrow should be interesting with no change of clothes and no toiletries!